The care of patients with breast cancer, as well as those at increased risk for the disease, requires the integration of the skills and talents of healthcare professionals from a variety of of disciplines. A team approach is the hallmark of patient care at the Weill Cornell Breast Center at Weill Cornell Medicine/NewYork-Presbyterian, where compassion and state-of-the-art care blend seamlessly in a serene environment. We know how a diagnosis of breast cancer can affect your life. Our experienced team helps to make your experience with breast cancer as comfortable as possible while delivering the most advanced treatment. As a leader in medical science, the commitment to breast disease research has led to groundbreaking discoveries for cancer treatments and cures. Eligible patients can take part in clinical trials, while other programs address special needs and concerns such as genetic testing, risk analysis, and prevention. 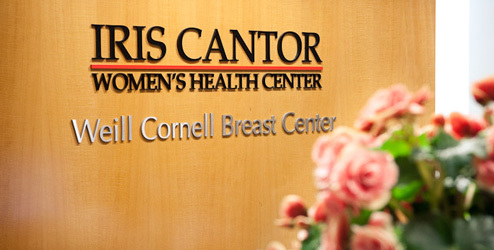 In addition, specialists draw on other resources within The Iris Cantor Women’s Health Center such as radiation oncology, specialized imaging services, reproductive endocrinology and nutrition consultations to give patients every advantage that medical science can offer in the fight against cancer.